Gorgeous, 5-5½" double, violet-blue flowers. 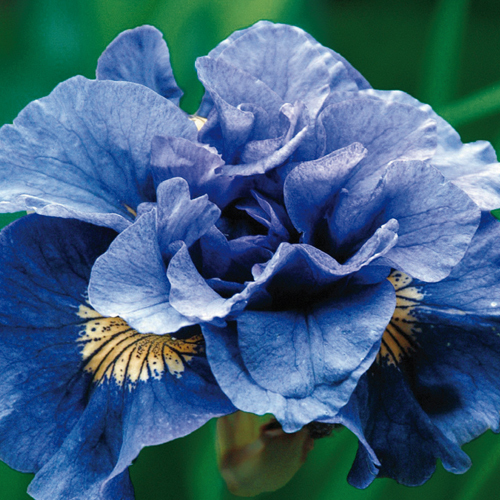 A favorite for planting along the edges of ponds, streams and boggy areas, Siberian Iris are easy to grow, naturalize well and have a tall, graceful appearance with slim, grassy foliage. They grow best in full sun to partial shade. Most Siberian iris bloom in June. Slightly arching, narrow grass-like leaves. Plant with the eyes just below soil level and large enough to accommodate the roots without bending them and 18-24" apart. Firm soil around roots and water in well. Prefers moist soils, but will do also well in regular garden soil with average moisture. Remove spent flower stems after blooming.